As Chief Programs Officer for Think Elephants International, one of my main responsibilities is to oversee all of our education initiatives, whether here in the United States or overseas in countries like Thailand. 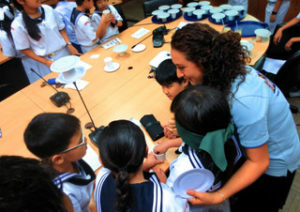 Many people don’t know that we’ve in fact been actively running education programs in the U.S. and/or Thailand since 2010! Think Elephants was founded by animal behavior researchers with an interest in understanding the evolution of social behavior and intelligence in elephants. Through our work we became intimately aware of the plight of elephants, and wanted to create an organization that would strive for long-term, globally implementable solutions. We strongly believe that the key to any future where elephants thrive in the wild is through human education, and thus our education and outreach programs were born. These programs serve as an opportunity to impassion the next generation (and this one!) to think critically about their role and responsibility to our planet’s future. 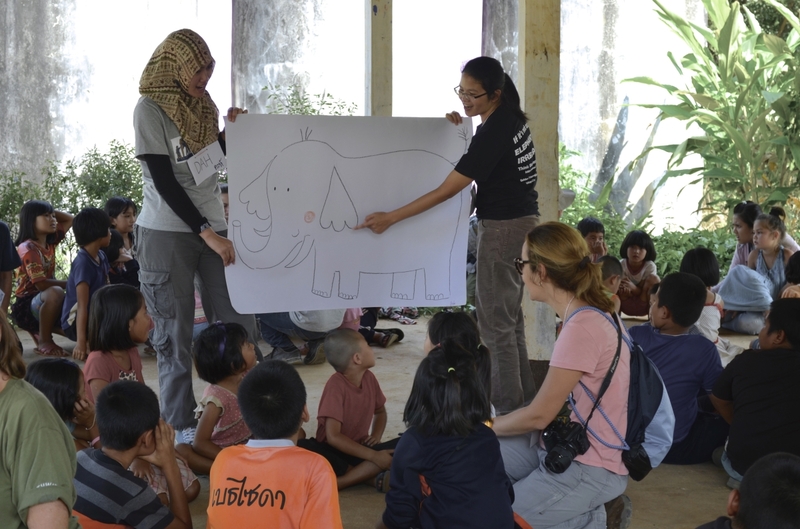 Our outreach activities have engaged people of all ages, from presentations with adults at one of our research site’s in northern Thailand, to Skyping elephants into classrooms in Australia. The focus of our full-scale education programs, though, has been on children aged 9-14 years old. What began in 2010 as an informal after-school program with a group of 15 students at a middle school in New York City, has now developed into a year-long curriculum that uses elephants as a model to not only teach, but excite, young students about scientific inquiry and conservation. Our students learn how research in animal behavior can be applied to conservation issues, how knowledge of animal behavior can help mitigate conflicts between humans and animals, and why conservation must be an essential area of interest for everyone because it affects everyone. They participate in hands-on, student-led lessons and activities aimed at developing critical thinking skills, and stimulating and supporting an interest in careers related to conservation, animal behavior, or scientific research. Throughout the program, they have the opportunity to learn about, practice, and apply the same skills that we as scientists use in our own research. You can learn more about our education program here. 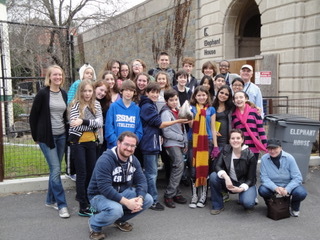 Some of our first students from NYC on a trip to the National Zoo. Since our start in 2010, we have run programs at several schools in New York City, one in California, and at nine schools across Thailand. 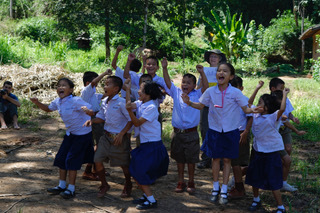 Looking back, it is amazing to think that over 600 students have participated in our education programs so far!And what is even more remarkable is that over 500 of these students have been from Thailand, where Asian elephant conservation efforts are so critical. Learning about an elephant’s ‘third’ eyelid! None of these programs, of course, would have been possible without the many incredible and talented instructors, both in the U.S. and Thailand, that we’ve had over the years. They are the ones in the classroom engaging students and making each lesson and activity come to life. Can you identify items based on smell alone? An elephant can! Programs like ours require a significant investment of money, time, and people. Therefore, we want to ensure that these efforts are effective not only in increasing what students know about elephants, but truly in shifting their long-term attitudes and opinions about elephants and conservation. And, as scientists, we want to have hard evidence that these changes are happening. Thus, to measure the effect our program has on our students, we have them fill out specially designed questionnaires before and after they participate in a program, and then compare any resulting knowledge or attitudinal changes with that of students who haven’t participated in a program. So, what have we found? Well, preliminary results are looking really good! 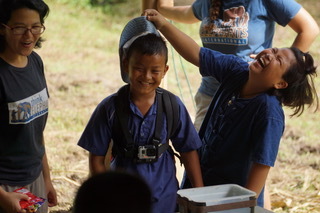 As we speak, we are in fact analyzing a large set of data from our Thai programs to see in detail how our program affects our students, and whether there are differences in effect, depending on whether a student lives in a major city or in a rural area that may experience conflicts with elephants. These surveys will provide us with critical feedback to continue to fine-tune our program, starting with the programs we are running this year in New York. Be sure to stay tuned to hear more about the results we find! Fun and games with elephant research! If you would like to know more about our education mission and how you can support our work, or collaborate with us in the future, please contact me anytime.